The reason that I have not been posting recently is because I was fortunate enough to receive a substitute teaching post at possibly one of the most amazing schools in South Africa; Southern Cross Schools. My husband was quite firm about me getting the job, while I danced around indecisively. Somehow he could see further than me and past my insecurities, technically he ‘made’ me do it. What an Ogre- right?! I have been teaching there for the last 4 months filling for a wonderful woman who was blessed with her first baby. I taught grade 5, 6 and 7 English and I actually coached the under 11 Netball Team (yeah I know…who would have thought? Definitely not me! And so you could say I was on a ‘journey’ as I discovered many new things about myself and had the opportunity to grow. I must add that I have a newfound respect for all mothers that work, single or not. I have learnt just how difficult it is to ‘have it all’, not impossible no, but there definitely are challenges I had never really considered. After 4 months of teaching full time, I can’t say that I’m sad to return to my ‘stay at home’ status, but having said that, I know that teaching is something I hope to be doing for a very long time. I’d like to tell you a little about this school though… this is no ordinary school. 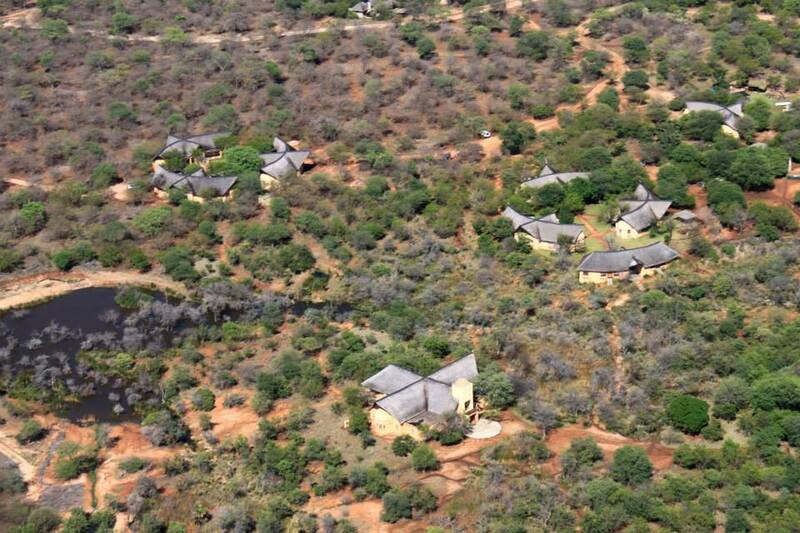 Southern Cross Schools is currently the ONLY nature based school in South Africa. 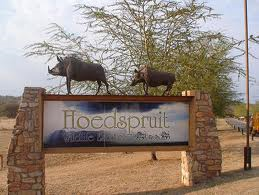 It is situated on a Wildlife Estate in our town of Hoedspruit. It combines traditional education with environmental education, ensuring that the children develop respect and love for the Earth that they inhabit. The area that we live in is very rich in flora and fauna and this makes it the perfect environment for my children to be educated and develop an environmental conscience. Classes are small and more personal with the number of children varying from 14 to 24 per class, and just one class per grade. 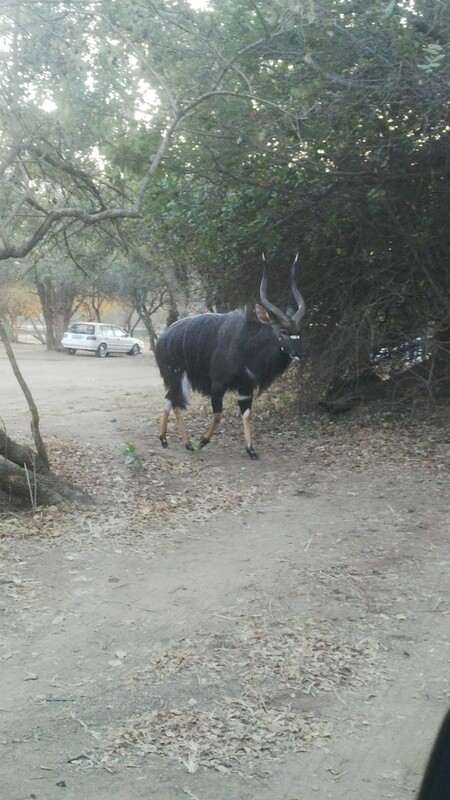 There are various types of animals which happily roam the school property; giraffe, warthogs, impala, nyala and many more. The children have an additional subject integrated into the curriculum called ‘Bush Lore’. 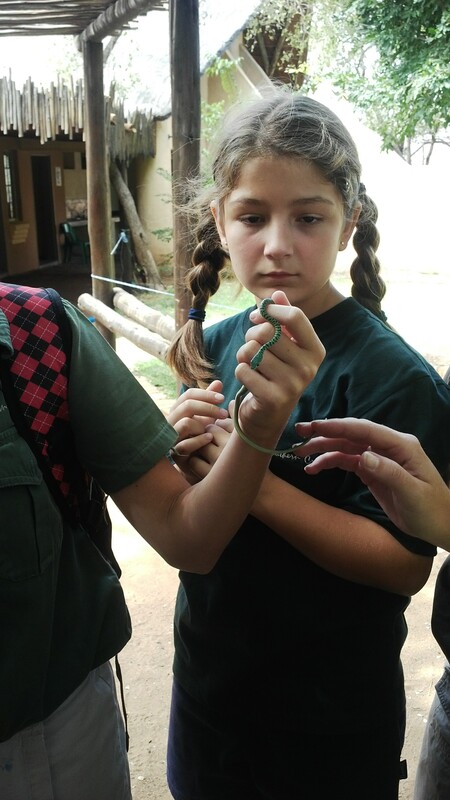 It is during these lessons that they go out into the bush environment to learn more about insects, plants, pollution, erosion and anything related to nature. 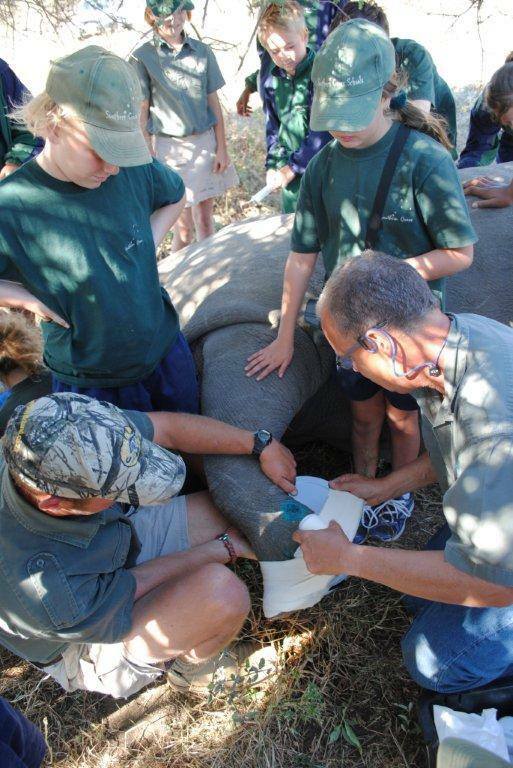 The Enviro Club also go on regular outings and recently were afforded the opportunity to watch a rhino being darted, while the local ‘vet’ cared for an injury it incurred. 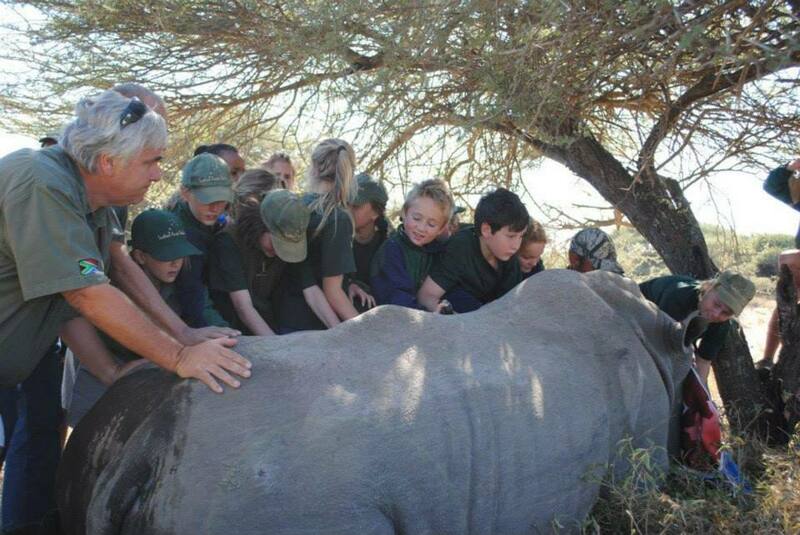 This was quite a thrilling expedition and had the kids bubbling with excitement. Every Wednesday the children engage in some type of cultural activity. There are many options available (Chess, Photography, Bush Rangers, Drumming etc.) I was in charge of the Junior Drumming Squad and let me just say- it definitely is not as easy as the children make it look! It was a wonderful learning experience. To say that the school is unique is possibly the least effective way of describing it. If you’d like more information please visit http://www.southerncrossschool.co.za you can also view the SCS drummers in action on YouTube. On my very first day at SCS, we were asked to be ‘vigilant’ as a leopard had been spotted on the premises the previous day! (Yes! Quite the welcome!) Fortunately, I did not pick up my bag and make a run for it and I have to say that this was an absolutely amazing experience. I noticed that it was common to find strange animals including snakes in the staffroom. This was simply a part of their/our lives. I realised that the sooner I overcame my fears, the better I’d deal with the ‘incidents’ like children handling snakes outside the classroom. They tried to convince me it was harmless, but I took my pictures and kept my distance. The staff at SCS are more like a family than colleagues. I was welcomed and shown the ropes by so many people who have become wonderful friends. I am truly privileged to be able to have these men and women teaching my children. Before I began teaching, I wondered how the staff might react to my headscarf/hijab. I think I am more aware of it than anyone else, but once they were comfortable with me, I happily explained and answered questions regarding it. It seems that the most common misconception regarding the headscarf is that my husband has requested me to wear it (forcibly or not). I was happy to tell them that this was actually my choice, and explain the reasons why. My darling husband (known as DH hence forth) did not take this kindly though. He was rather offended that people saw him as this ogre who ‘made’ me do things against my will. He also said that this was probably what people who didn’t know us thought of him, as he innocently walks along side me in Pick n Pay. Now, if you know, or have happened to meet my husband, you would know why I had a good chuckle about this. This ‘ogre’ is the very same man who asks ME to watch the snake in the house and make sure it does not go anywhere, while HE gets help! This is the very same man, who see’s to dinner when I simply cannot manage and I’m being a grouch; who watches the same cartoons repeatedly because his boys want him to; who reads “What to do Blue?” (with intonation and expression I might add) at bedtime; who supported me through this entire juggling act, making sure the ball was never dropped at home or at school (even when I forgot to arrange for my boys to be fetched from school). I am very fortunate to have someone that does not hold me back, and gently nudges me on throughout my self-doubt, even though I know there are times when I think he’d like to nudge me down the stairs. Firstly I must apologise for the length in between my posts. 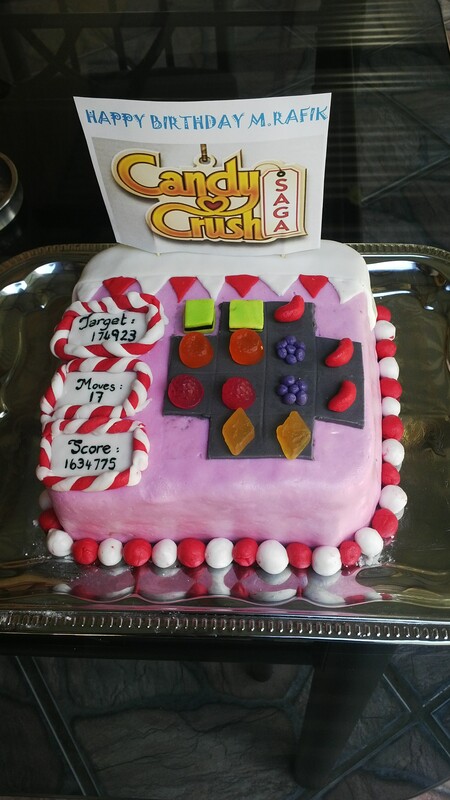 I have recently started teaching once again at a local school and have been consumed with learning the different rules and regulations at school, as well as with lessons and school activities. I will do a post on the school soon as it is very different from my previous experience. 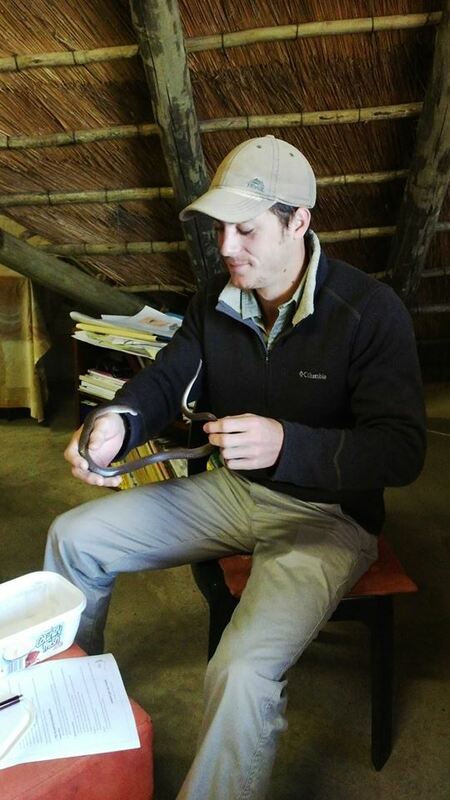 This is the only nature based school in South Africa and I am extremely excited about my new endeavour. This post is to share with you a little piece of heaven we discovered recently, a mere 20 min drive from our home. We have come to realise that in order to instil value and appreciation for our environment and nature in our boys, it would mean US as parents showing this to them through our behaviour. We began this year with our second visit to the Berry Festival (we chose blueberries- my favourite) in Magoebaskloof, where we picked (and munched on) organic berries, enjoyed freshly blended berry juice and later blueberry muffins using our organic pickings. We also enjoyed the Mango Festival at the Bavaria farm just outside of Hoedspruit. The children had the opportunity to ride at the back of a truck (yes very exciting) and picked a box full of mangoes right off the trees. They also learnt about different varieties of mangoes. 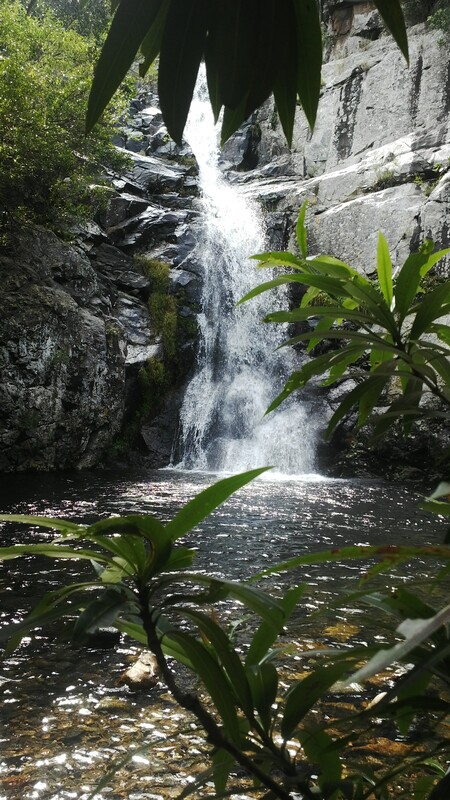 The absolute highlight so far in our ‘Nature Adventures’ was the hike we attempted to a waterfall nearby. We were slightly nervous as to whether the boys little legs would manage the walk but decided to attempt it as it is something we had not done with them as yet. So on Friday, (the public holiday) after prayers, we geared up for the hike with some ‘padkos’ (light snacks to have along the way). We packed a backpack with the necessities like water; caps, sunblock, some towels for after the swim and off we went. My oldest son who is almost 6 was rather nervous once we started our journey into the ‘woods’ … you see… according to him, this was where the wolf lived! The wolf?! Yes, the wolf….you’re familiar with the one…he tried to eat the 3 little pigs and harrassed Red Riding Hood. He knew these stories and many more very well with all my mother’s fairytale telling. We eased his fears by telling him that “that” Wolf actually stayed in a different woods and that this was a good forest, so there was nothing to fear. We stopped along the way to look at strange mushroom type plants growing on the barks of trees… of course my younger son looked quite confused as there were no ‘dogs’ there, so it was a learning opportunity as he realised that trees have barks as well. It took us approximately 20 mins to reach our destination as we paused along the way showing the children different aspects of nature, the roots from trees uprooted by recent floods, butterflies, and parasitic trees; which grows from the ground up, to nearest tree and basically strangles it. So it seems that this forest wasn’t as good as we made it out to be as pointed out by the older son. 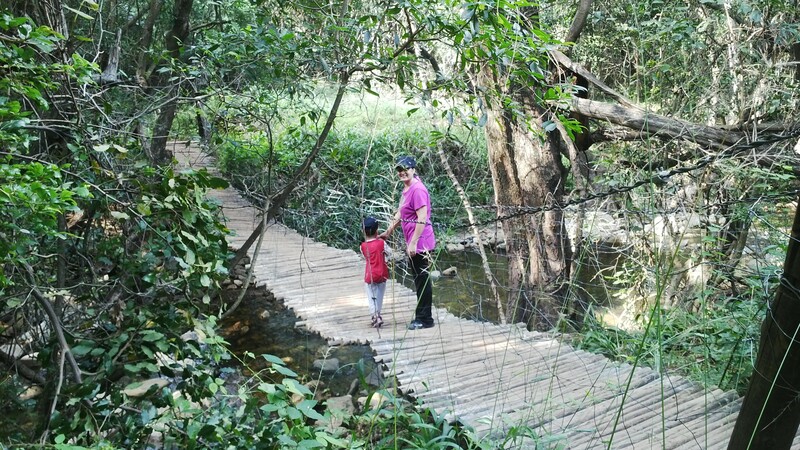 We also had to cross a rickety bridge which swayed from side to side as we crossed. My younger son thoroughly enjoyed the danger in this, true to his fearless spirit. 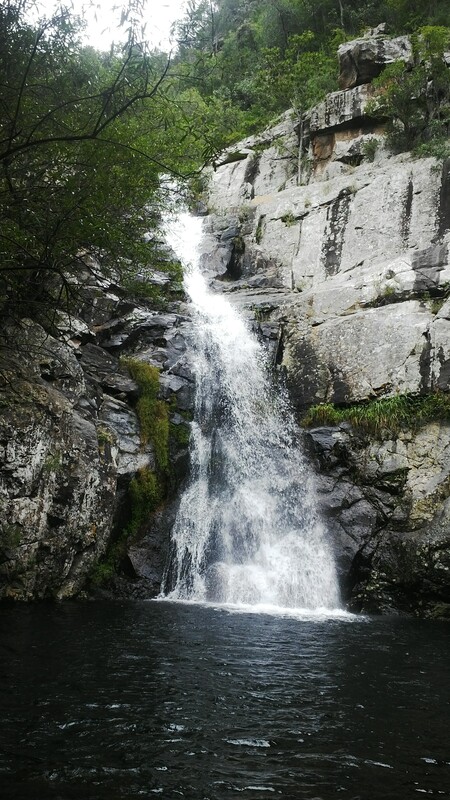 They did manage the hike quite well but once we reached the waterfall, being typical boys said they were starving. We let them enjoy their burgers while dipping their feet in the crisp and clear water of the waterfall. This has to be one of my favourite places in the world and lucky me; it’s just a stone’s throw away. We let them climb up rocks and explore the shallow water while throwing stones as far as they could. They actually had so much fun they did not want to leave so we spent a fair amount of time there – taking in the mesmerising sight of the sun as it hits the waterfall and the sound of the water hitting the bottom blocking out all the other sounds of the world… a little piece of heaven. 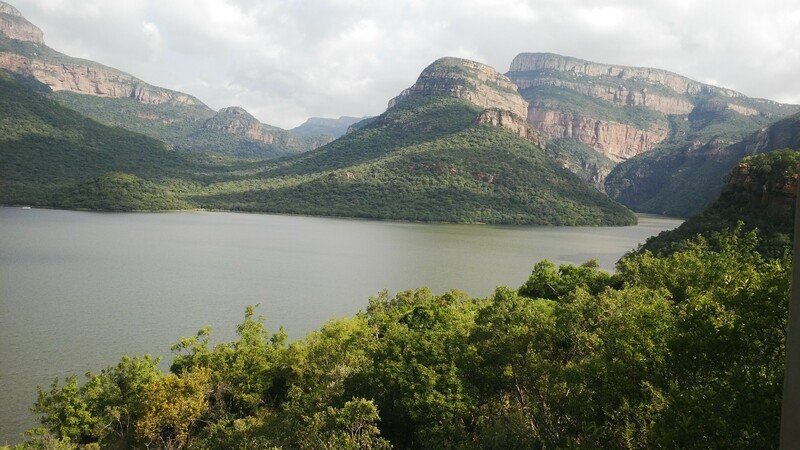 We also spent some time admiring the views further up of the blyde dam. 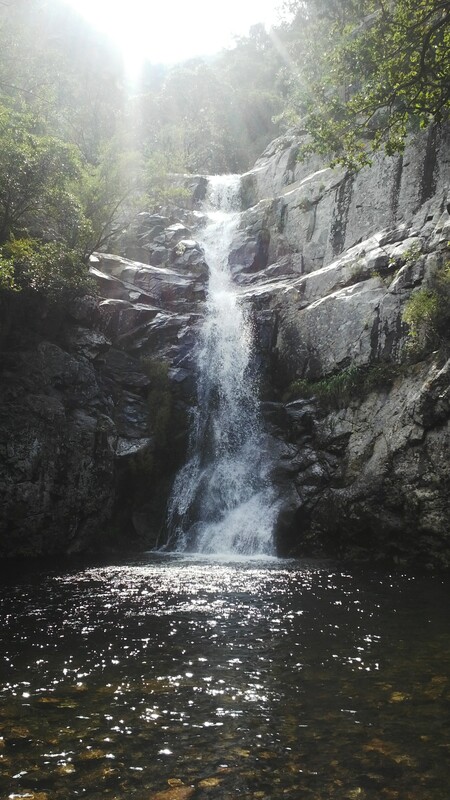 If you do happen to be on this side of the world … a trip to the Swadini Nature Reserve Waterfall in an absolute must. If you’ve read my welcome post, you will know that I live in a rather remote part of South Africa…and it definitely has its pros and cons. We get to live very private lives, free of noisy, and sometimes inquisitive neighbours or unexpected guests. My children still get to take walks down the road and ride bicycles. 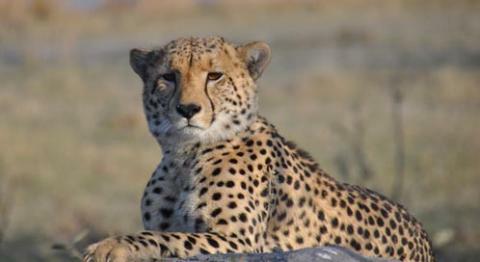 They were recently invited by the local vet to watch a tooth extraction of a cheetah. 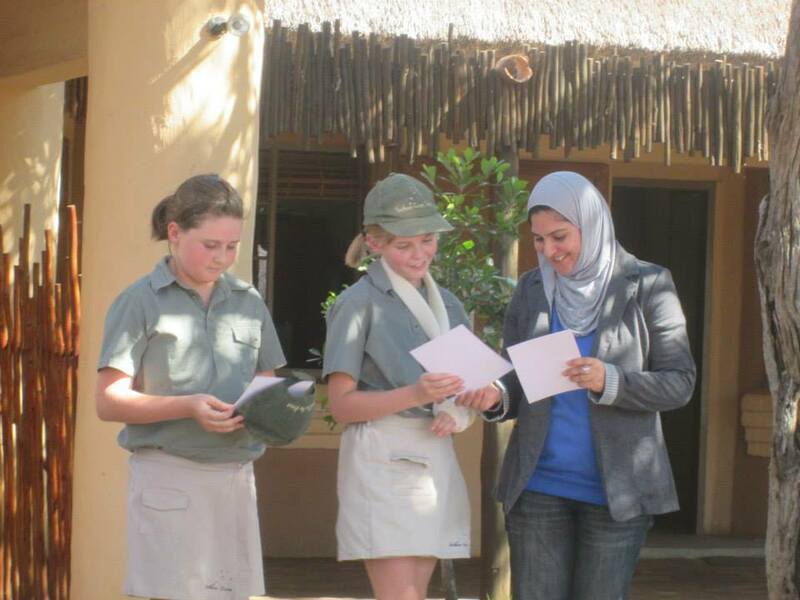 School outings involve game drives and my youngest goes on a ‘bush walk’ every week. They learn to identify animal prints, and are often treated to seeing wild animals along the walks….like ‘hot dogs’ as my toddler calls them….ie. Warthogs. They are exposed to situations that are very unique to our environment. We have veggie gardens, and chicken pens, chameleons (every now and then) and backyards with ample space for games, climbing trees, etc. A drive to school takes approximately 2-3mins. We don’t have traffic …EVER!! Post office and bank runs are often easy with a queue of 4 people considered to be ‘busy.’ And our town is actually very safe. But like all things in life, there are always cons. We have no halaal food in our area. The closest halaal take away is 20mins away… so there’s no ‘ordering out’ for a meal. There are no halaal butchers, so our freezers need to be stocked quite well. And we need to plan in advance should we have any major family get togethers. My kids are the minority in school, with there being 2 other Muslim children in my sons Montessori and my younger son has his cousin in playschool. But that’s basically it. I face challenges that mothers living in bigger towns and cities rarely even give a second thought to. For Islamic education, we do most of it ourselves, at home. We don’t actually hear Azan (the call to prayer) unless it’s via the TV or Radio. So even out of Ramadaan, we can still tell you the exact time of Magrib prayer in Hoedspruit. Like all humans we have adapted to our environment. At Montessori there is a strict no sharing of food policy, due to allergies, which suits me fine. Montessori has even set up and Istinja table with a little jug and some flushable wet wipes as they are encouraged to be independent. You don’t ever consider the impact of not having other Muslim families around you until your children show them to you. A few months ago my 3 yr old had forgotten his lunch box in the car and so at lunch time I had to return to school to deliver it. You can imagine my shock when I found him confidently chewing on a piece of biltong…..that I obviously did not send to school- which meant only one thing…. I asked him what that was and he happily replied that it was a piece of biltong a friend had given him. The teacher quickly removed it from his possession. These are the types of risks I run, and even though all precautions are taken to avoid this, sometimes these things happen. I have a sister who, as a child, unknowingly ate haraam biltong .And a cousin, who as a toddler drank black label beer thinking its coke. They seem to have turned out fine…. We have however drilled it into my toddler’s head that he is not allowed to share food with anyone except his cousin, as his school doesn’t have strict rule that Montessori does. He seems to understand and we have not had further incidents. 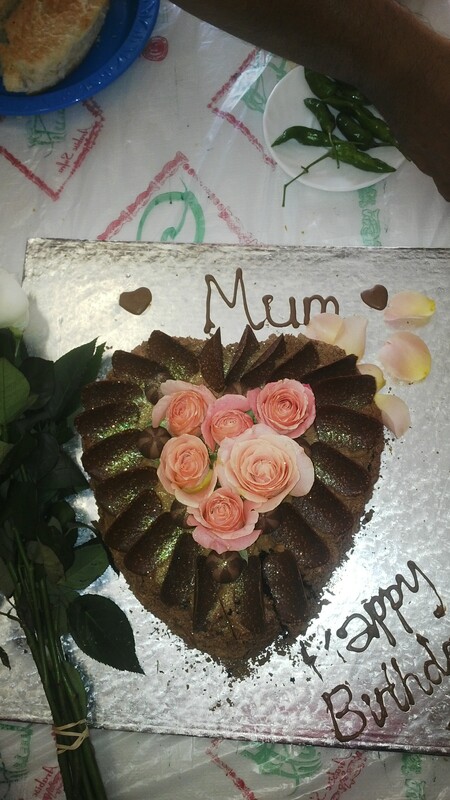 Given the choice….I still prefer to be a ‘country mum’ or in my case….a ‘bush mum’…incidents and all!